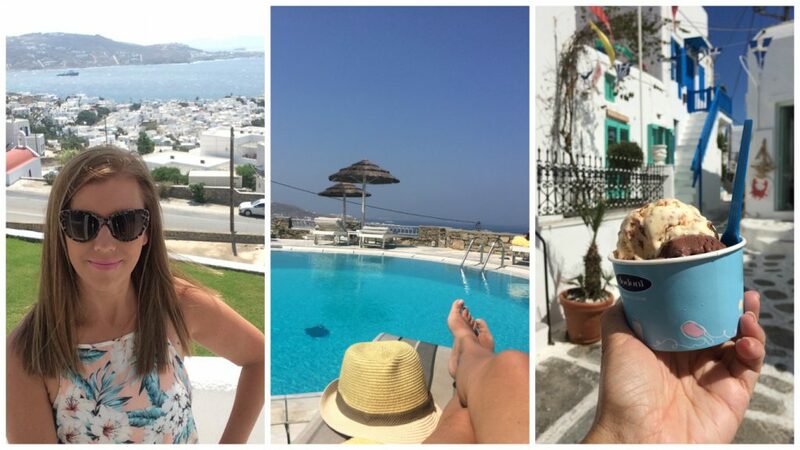 If you are heading to Mykonos, one thing you do not want to do is to forget your camera. 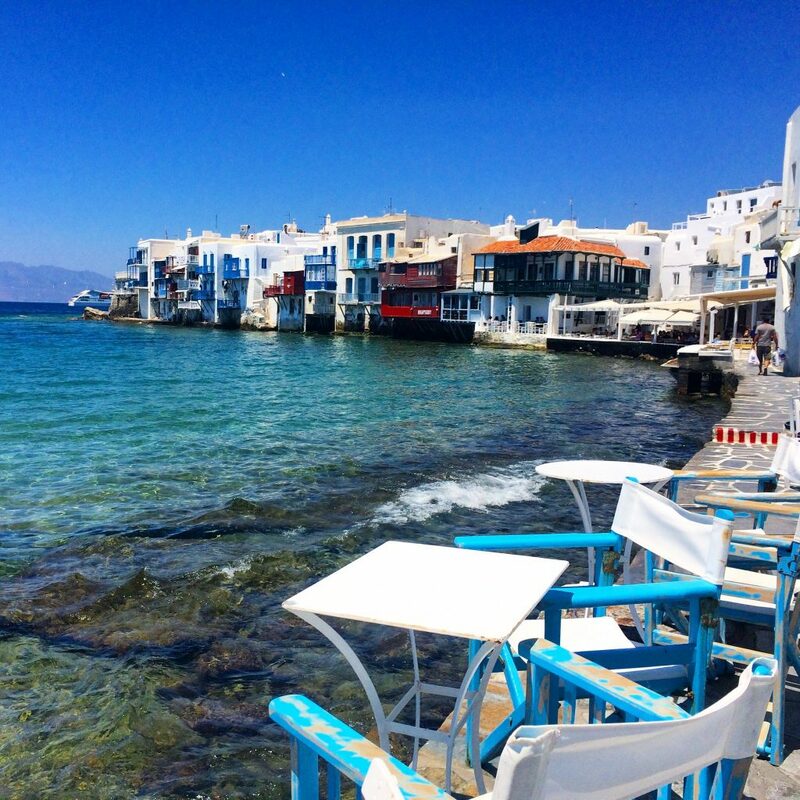 Mykonos is quite simply a photographers paradise. I know for me, it was like being a kid let loose in the candy shop. The scenery is as pretty as a picture and with a camera in hand you’ll most likely send it straight to instagram. 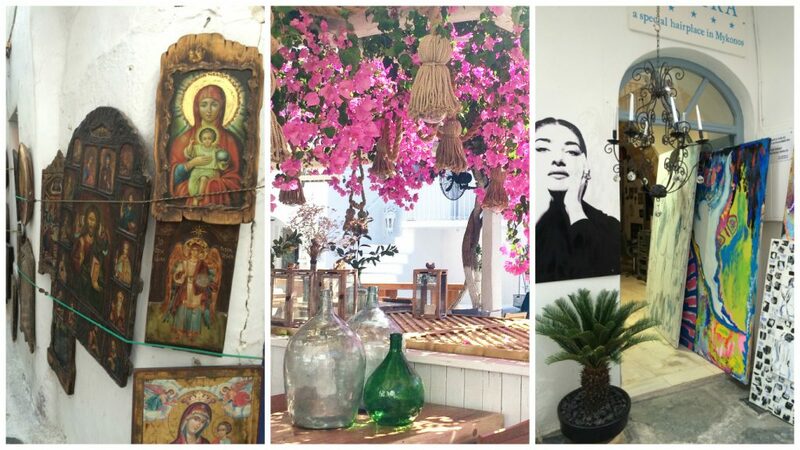 Here I show you some instagramable places in Mykonos, that will be sure to fuel some major wanderlust on your insta account. Below are some pics straight from my instagram account Travel Drink Dine. 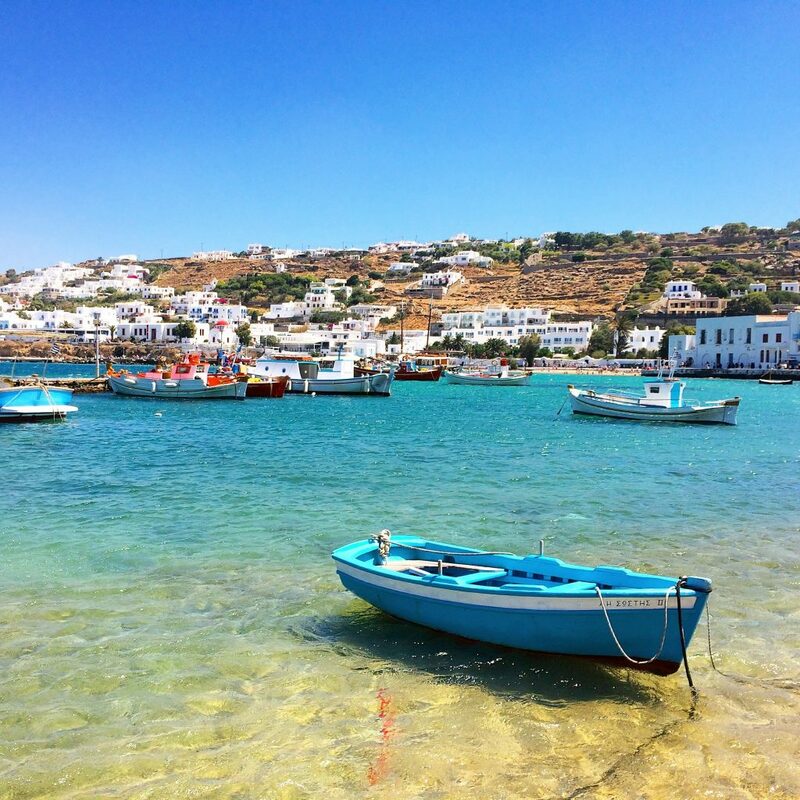 Mykonos is full of dreamy vistas. Below is a photographers firm favourite. 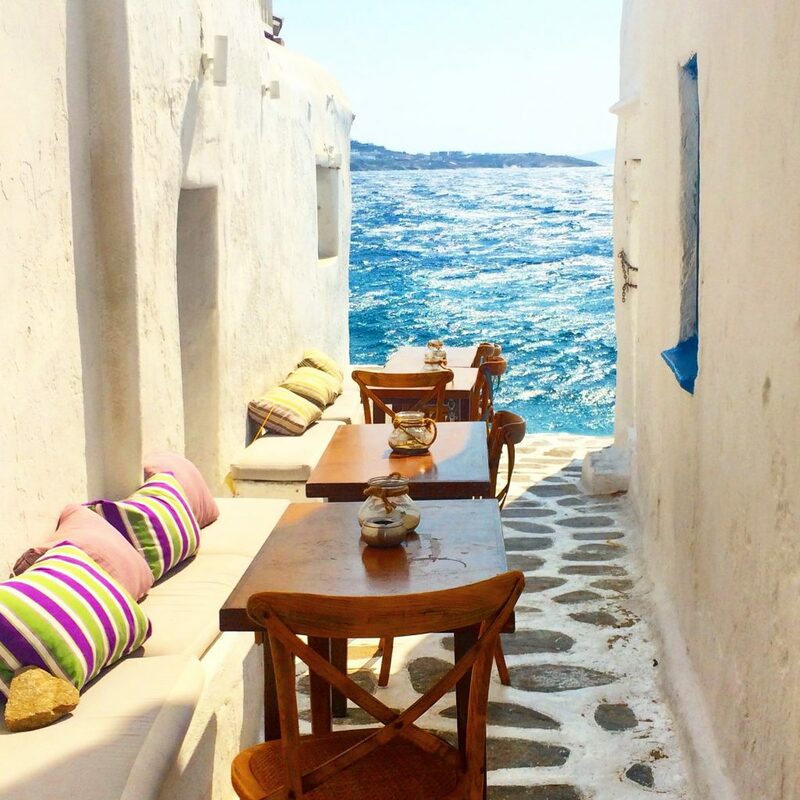 Tables set down a narrow alley way with the ocean literally at your feet. 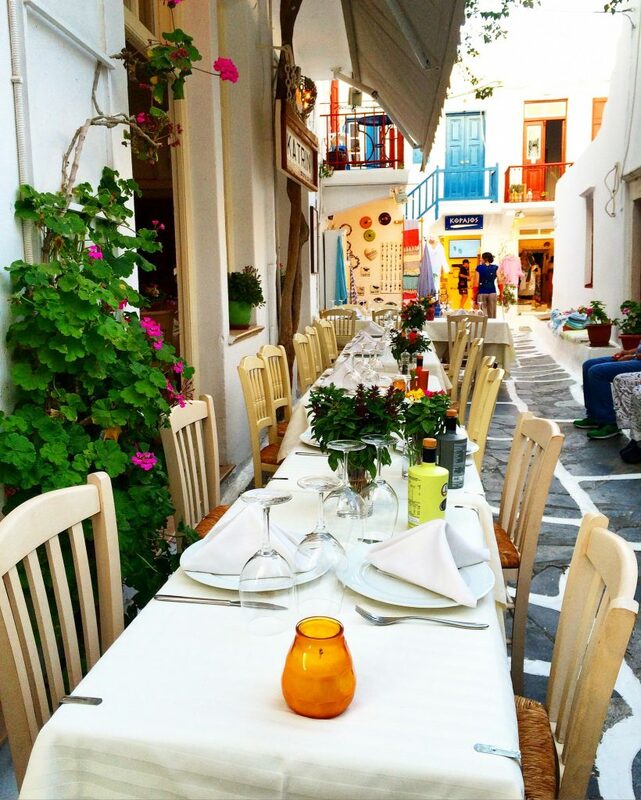 The restaurants name is called Kastro’s and can be found not far from Little Venice. Go early morning to get an insta shot without a soul about. 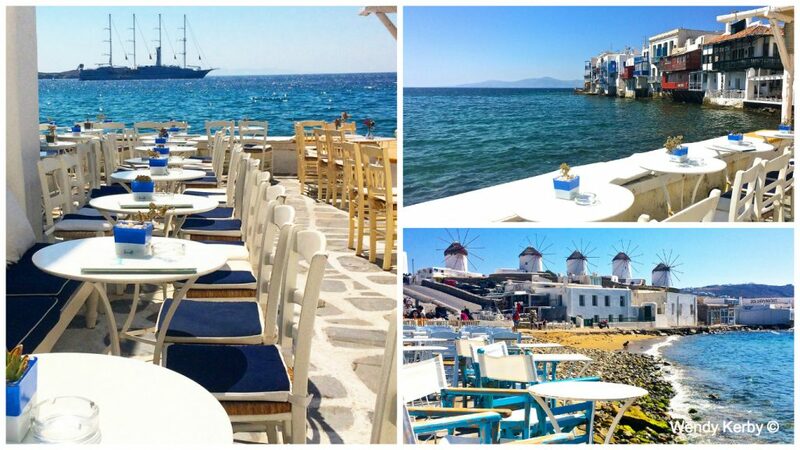 The Port of Mykonos is beautiful from all angles. Boats of many colours make for a great seaside scene. On a sunny day the water glistens an aqua shade of blue. 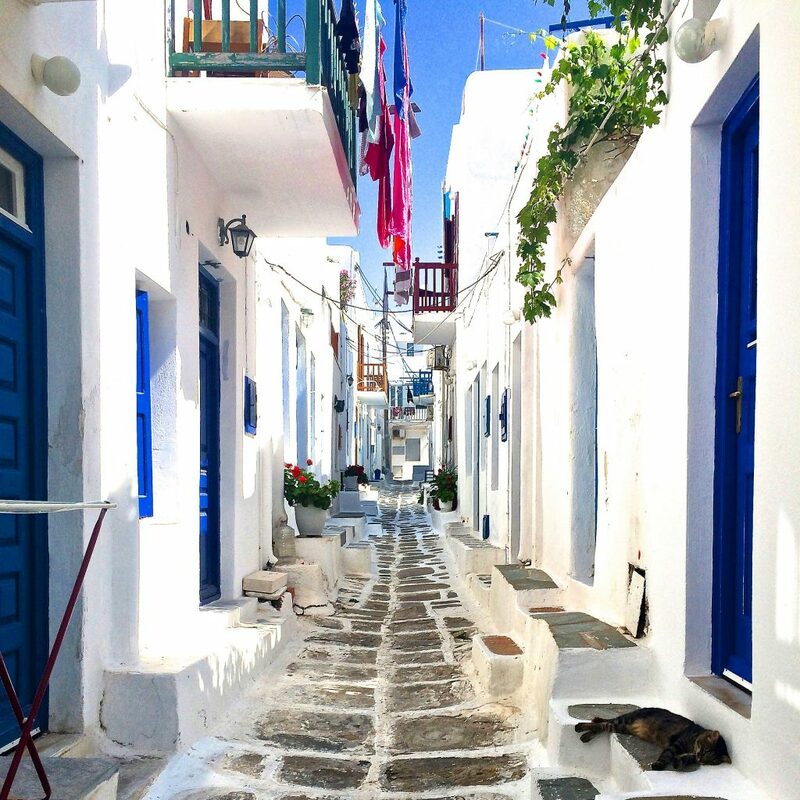 Getting lost in the lane ways of Mykonos Town is something that is very easy to do! My first attempt navigating around this old part of town had me lost for quite awhile, trying to work out how to get back to my accommodation. Alas it’s not so bad because you can find some amazing spots to take a quiet photo. My tip is go very early in the morning when most of the town are still sleeping. They don’t call it party town for nothing, so I took advantage of the prospect that most people will be nursing a nice little hangover! I took these around 8 am on a Sunday morning. 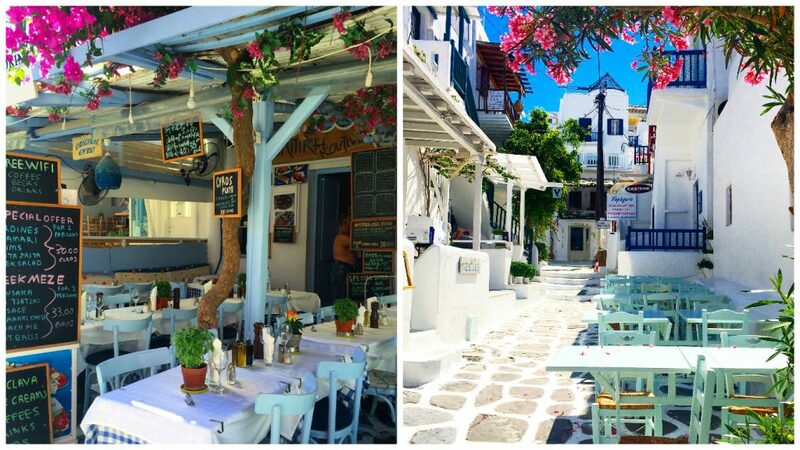 A gorgeous little part of town and definitely one of the most instagramable places in Mykonos is Little Venice. 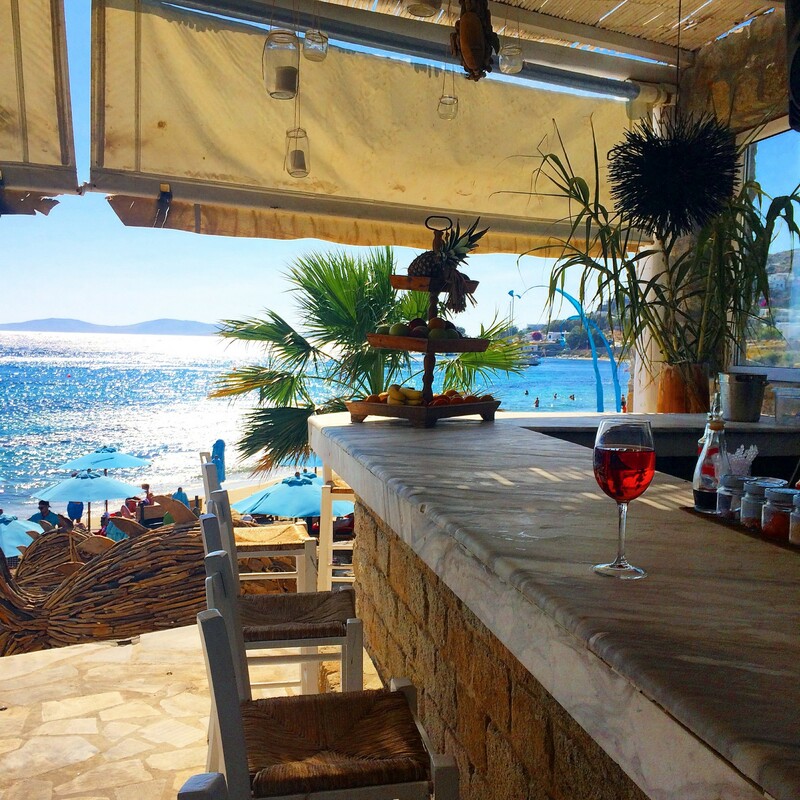 A popular spot for both photographers and artists who come to capture the Mykonos seaside. Avoid sunset if you are after a shot with little to no people. How inviting are these gorgeous table settings! 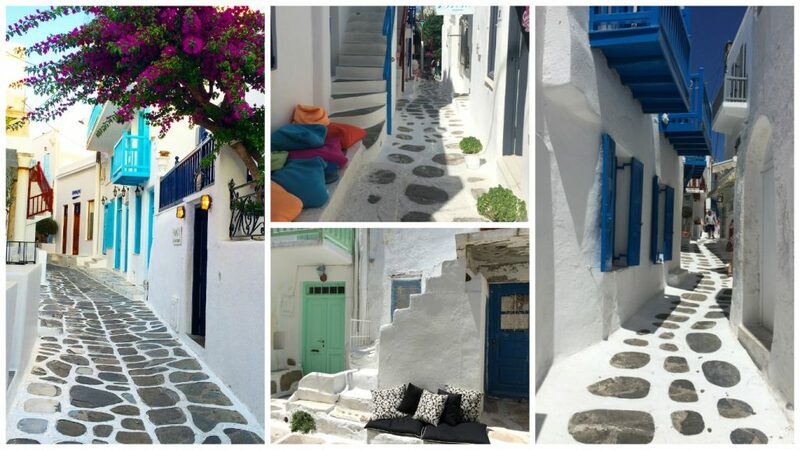 These are a selection of many you can find in the heart of Mykonos town. The restaurant Katrin certainly cuts a striking scene early evening when the candles softly flicker in the night. Plenty of colours for a perfect instagram shot. 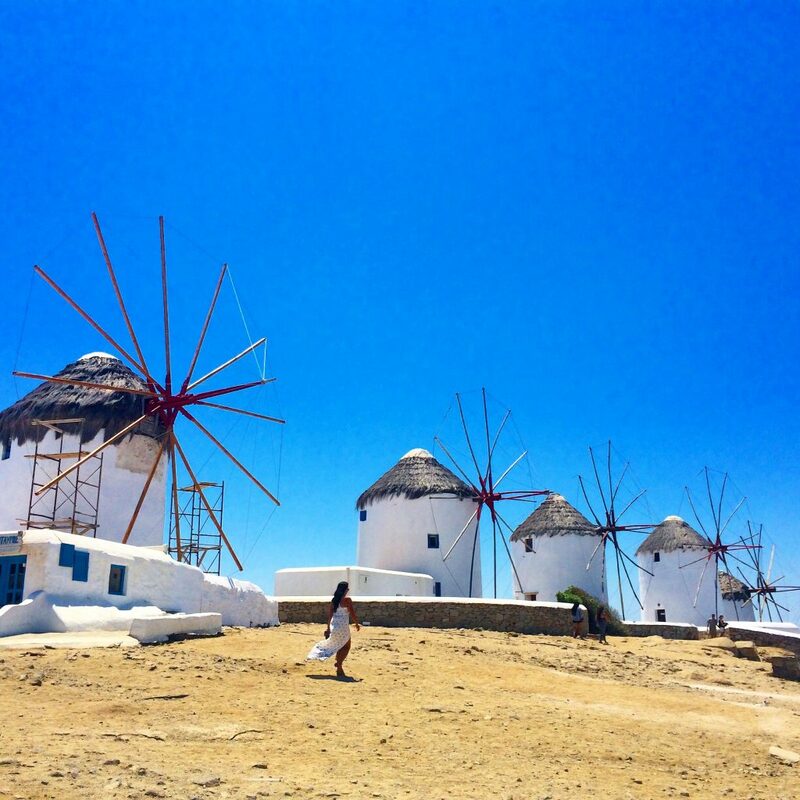 The famous Mykonos windmills make for a pretty scene of blue against white. 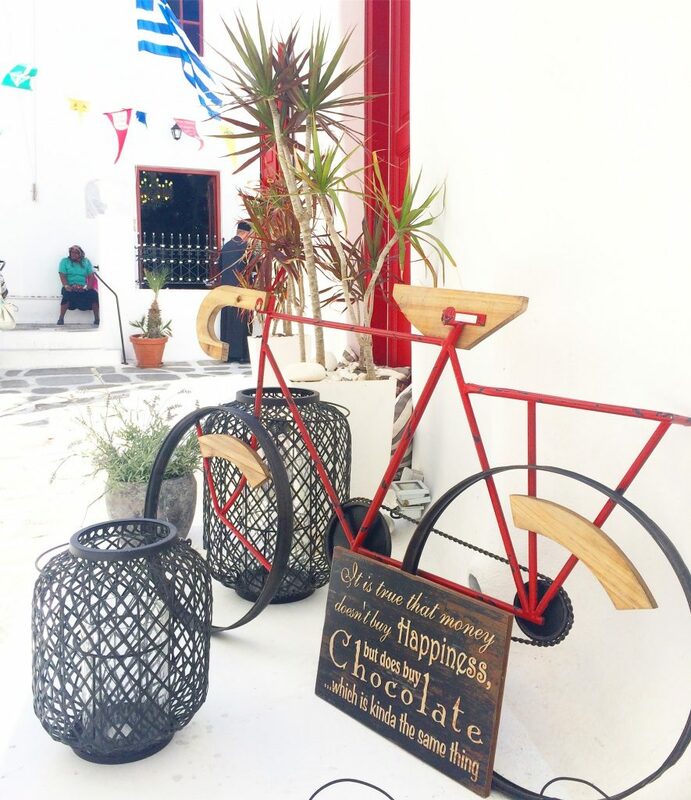 Locate not far from Little Venice and easily a perfect instagramable moment. 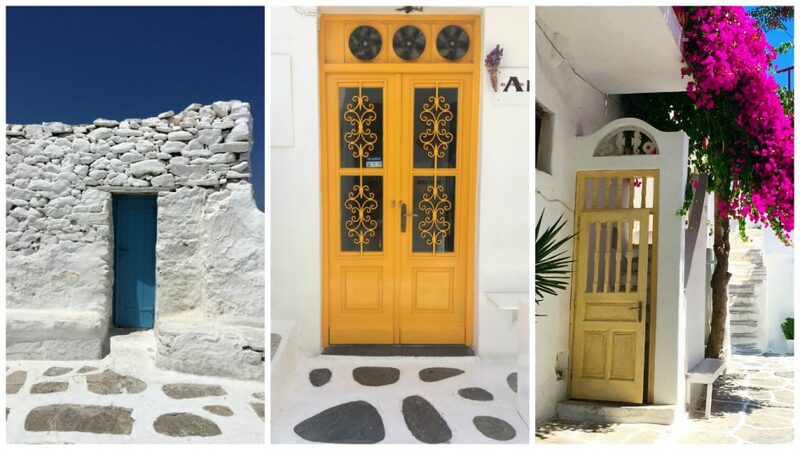 If you are like me and love to photograph doors, then here is your chance to get some truly unique ones. 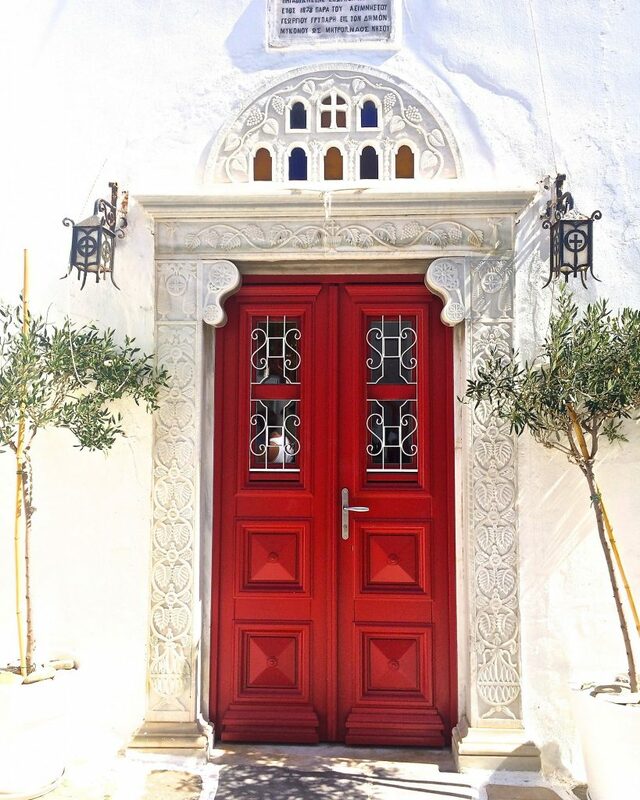 Some are intricate whilst others are plain and simple against a white washed building. Art and objects are everywhere and if you have an eye for detail, then you will certainly not miss a trick here. Pieces are thoughtfully placed in lane ways, on steps, beside doors and on tables. You’ll find plenty of art inspiration on the streets.